There are over 200 recognised eye conditions. 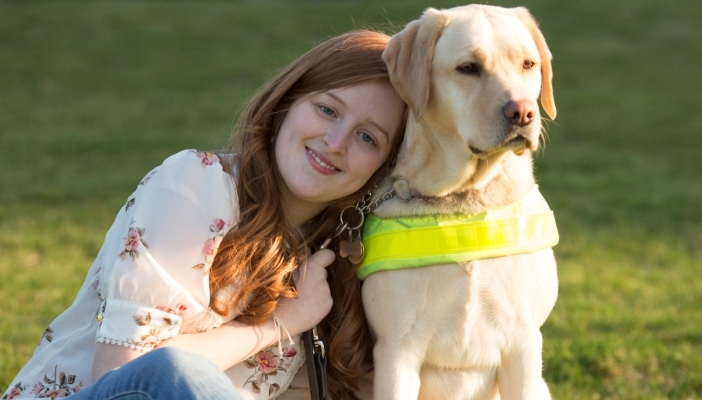 Some conditions are much rarer than others, many people have more than one condition and for some, sight loss is only one aspect of another condition altogether. NB Online spoke with Emily Davison about septo-optic dysplasia. 1. What are your conditions and how do they affect your sight? I have septo-optic dysplasia (SOD), which is a condition that means I have both optic nerve hypoplasia and pituitary gland abnormalities. Optic nerve hypoplasia means that my optic nerves are severed, impairing a vast amount of my sight. I’m completely blind in my right eye, with only central vision remaining in my left. It’s rather like looking through the porthole of a ship. I have reduced depth of field vision, so if someone could see 24 metres, I can only see six. I also have nystagmus which makes focusing very difficult. It’s like looking through a camera with a pretty bad autofocus and I can’t always focus on the things I want to. Yes, both of my conditions are congenital and my nystagmus is linked to my SOD. It was suspected that there was an issue with my eyesight when I was eight months old as I wasn’t able to distinguish or focus on certain objects. Tests showed my eyes themselves where healthy so I had electro diagnostic tests to measure the activity of my brain. These confirmed that my optic nerves were impaired. I then had an MRI scan and various tests at Great Ormond Street Hospital before finally being diagnosed with SOD at two years old. But I still had to undergo many more tests to diagnose the severity of my condition. Not for my visual impairment, but certainly for the other side of my condition. I currently take hormone replacement therapy and growth hormone injections to regulate my hormone levels and blood sugar, which is low, due to hypoglycaemia. As my body doesn’t produce the steroid hormone cortisol in the same way others do, I also carry a medical kit with me which includes an injection of hydrocortisone for emergencies. Yes, it was incredibly difficult. When I was first diagnosed there was virtually no information about SOD. Even consultants didn’t know much as there were only a handful of known diagnosed cases in the UK. My parents were given one small pamphlet and that was it. 6. How do your conditions affect you day to day? I am unable to drive due to my lack of sight so let’s hope for self-driving cars in the future! Until then though I will be more than happy to commute from place to place with the help of my little guide dog, Unity. My sight loss also impacts on my ability to read print and write by hand. Of course, my condition affects more than just my sight and there are days where I am sick and unable to get out and about. I think that’s where my love of blogging, video making and writing came from. When I was younger I spent a lot of time off school and college due to my illness so learned to teach myself. I now have a degree in English Literature and a Masters in Children’s Literature. 7. Do you know if the conditions affect different people in different ways? Some people experience more severe symptoms than I do, some experience it on a more minor scale, and how it affects eyesight varies greatly from person to person. That SOD can be incredibly complex, it can impact on a number of things. The spectrum of SOD is so diverse and varied, every diagnosis is completely different and no two cases are the same. Technology is my best friend, I honestly don’t know where I would be without it. It’s made it possible for me to do many daily tasks like online shopping, socialising, and reading. It’s also given me the power to run a blog, a YouTube channel and a podcast channel as well as to study. I use mostly Apple products and accessibility features, audiobook apps including RNIB’s Overdrive and Audible and apps to help me plan travel routes. As for more specialist equipment I also use an electric magnifier and a C-Pen reader which allows me to scan passages from books to a word document. People always assume when they see me that it’s just my sight. Actually, my eyesight is the easy part of my condition because it’s predictable and doesn’t change that much. My health however constantly fluctuates and managing it can sometimes be a little exacting. People also assume that I’m fully blind on account of the fact that I use a guide dog or a long cane, but I still have some remaining vision, which can be useful when abetted by visual aids. Retinal dystrophy or optic nerve hypoplasia – where the retina and optic nerves within the eye are damaged. Anophthalmia – the absence of one or more of the eyes. Microphthalmia- a developmental disorder where one or both, of the eyes are abnormally small. Coloboma – a hole formed in one of the structures of the eye. Where can eye health/sight loss professionals find more information on the condition? There is extensive information available via the GOSH website. As part of GOSH’s pioneering research programme, Professor Mehul T Dattani is leading a project to identify the genetic causes of septo-optic dysplasia. Watch Emily's video: Living With septo-optic dysplasia. Follow Emily through her blog, YouTube channel, Facebook, Twitter @DavisonEm and Instagram @fashioneyesta2012.